This is the second in a series of stories looking at legendary moments in Ohio State football history. Did they really happen the way the story says? We went back and checked original sources to find out. Previously: Did Ohio State Lose A Bet To Put Michigan Colors On The Horseshoe? Not the way the story says. Woody Hayes’ final consensus national title came in 1968 with a team loaded with sophomores. The ‘Super Sophs’ included quarterback Rex Kern, defensive back Jack Tatum, defensive lineman Jim Stillwagon. All three are members of the College Football Hall of Fame. 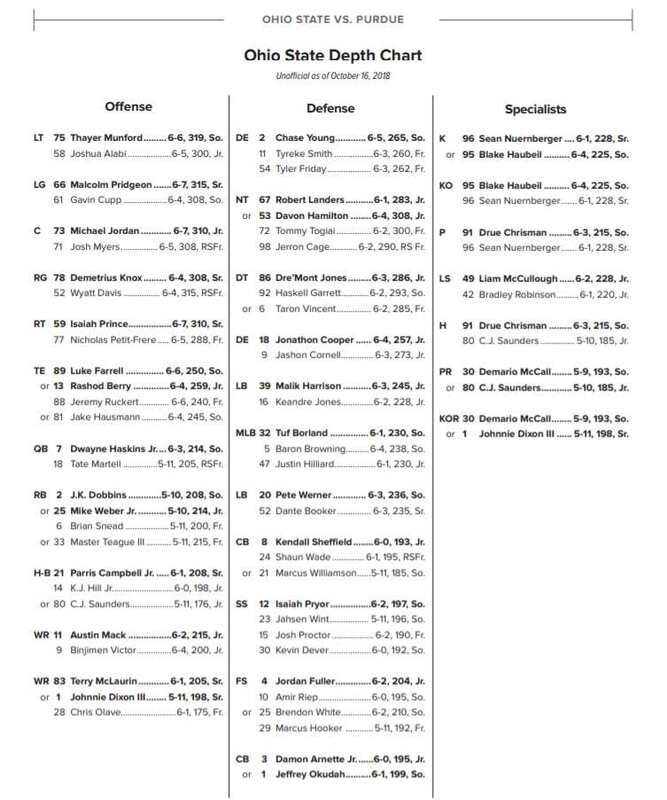 A total of 13 sophomores would start that year’s Michigan game. In this case, ‘Super’ was not hyperbole. The young Bucks shocked top-ranked Purdue, 13-0 in September and then rolled into the regular season finale unbeaten and ranked No. 2 in the nation. They faced Bump Elliott’s final Michigan team that day, and the Wolverines were no joke. They entered with an 8-1 record and a No. 4 ranking. The game was close for a half. OSU went into the locker room clinging to a 21-14 lead. It was still just 27-14 after the third quarter, but the Buckeyes finally put things away late. A field goal and two touchdowns made it 44-14 in the final minutes. 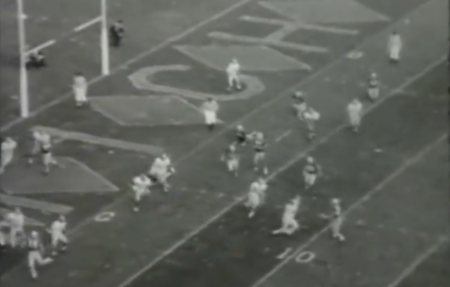 Following a late interception, fullback Jim Otis powered the ball in from a yard out. The score made it 50-14, and Otis celebrated by throwing the ball into the stands. The famous two-point conversion attempt. However, instead of kicking the point after, the Buckeyes went for two. It’s a common misperception that they went for two to push the score from 48 to 50. In reality, it was already 50-14, and the conversion attempt failed. “Hayes explained that the Bucks went for two because regular center John Muhlbach was hurt and field goal kicker Jim Roman had to center. Ordinarily, Larry Zelina would have kicked the extra point, but Hayes said he had received a blow to the head and wasn’t able. And also, “we wanted more than 50 points,” Hayes admitted. The Michigan Daily recap quotes Hayes several times on different topics, but doesn’t provide the famous ‘go for three’ line, either. The Akron Beacon-Journal had a similar quote. The far more colorful postgame quotes came from the other locker room. The legendary line about his inability to “go for three” never appeared in any of the recaps from that day. The Ohio State University Archives does not have a transcript of Hayes’ postgame interview from that day. That would conclusively settle the issue one way or the other, as would a film or audio recording of that interview. Hayes certainly said those words at some point. It became an often-repeated story later in his life. One of his assistants from 1968, Lou Holtz, has told the story ad nauseum. But every indication is that Hayes very likely did not say them right after that 1968 game, as the legend says he did. An alternate version of the story says the quote actually happened following the 1961 game. That was another year when Hayes went for two late in a blowout win over Michigan. 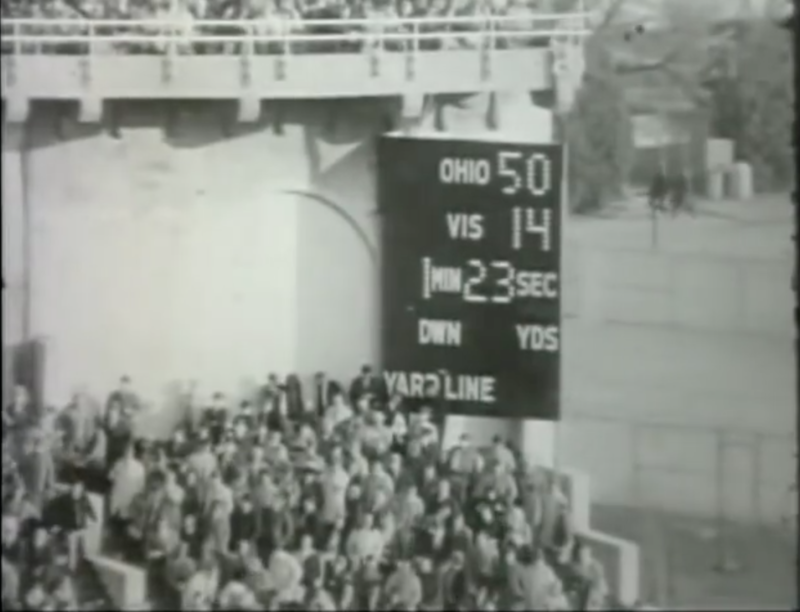 In that game with the Buckeyes leading 42-20, OSU quarterback Joe Sparma completed a 70-yard pass in the final minute to put the ball at the Michigan 10. Three incomplete passes later, Sparma connected with Sam Tidmore for a touchdown pass with just 6 seconds to go in the game. Then Sparma hit Tidmore again for the extra two points to bring the score up to an even 50. Again, there is no talk of going for three in the following day’s Columbus Dispatch, Cincinnati Enquirer, or Dayton Daily News. Instead, they mention that it was payback for Michigan kicking a field goal late in a 58-6 win over the Buckeyes in 1946. “Because I couldn’t go for three” is a powerful statement on the passion and hatred in the Ohio State – Michigan rivalry. It has been emblazoned on t-shirts and inspired generations of trash talk. But from all indications, it’s just a good story. I believe there is close to certainty that Woody uttered those words after the ’61 game. The last TD was a short pass to end Sam Tidmore in the last minute of the game. I could not believe it when we lined up for 2 pt conversion, and then threw for it! We didn’t throw the ball much! Woody was definitely trying to rub it in TSUN face. The circumstance that were described for the ’68 game are accurate. Our center did get hurt and Roman, our place kicker was the back-up center. With Zelina out we did have any one to kick. I always thought that was a creation of Lou Holtz, who I believe was an assistant at the time. I was a sportswriter in south Carolina and thought I remember him telling a banquet crowd about it. All I need to see. Well this is a party-pooper or an article. No offense, but legendary stories contribute to the fun and aura of the rivalry. Can’t we keep it that way? I mean. . . what is the sense of performing such a “snopes” analysis? Well, you could always just not read them. You’re ruining my childhood, Tom! Good stuff!